In 1982 he was appointed Principal Trombonist of Great Britain's City of Birmingham Symphony Orchestra by Chief Conductor Sir Simon Rattle who declared him "not only one of the most able trombonists in my experience but also an intelligent and wide-ranging musician". Prior to coming to Britain he held the position of Principal Trombonist with both the Radio Stuttgart Orchestra and the Jerusalem Symphony Orchestra. Since 1994 he has been the artistic director of the international touring ensemble, Posaune Voce Trio, which specializes in the performance of newly discovered baroque works featuring the alto trombone in a solo role with voice. In the U.S.A. he was a member of the popular rock band the Atlantics, performing for such artistes as Michael Jackson, Olivia Newton-John, Natalie Cole, Paul Anka, the Drifters, Pearl Bailey and Andy Williams. He is much in demand as a guest soloist, having appeared with the U.S. Navy Band, the U.S. Army band, at the Smetana International Music Festival, the Malta International Arts Festival, the Dvorak Summer Festival, the Edinburgh Festival and the London Barbican, as well as presenting recitals and master classes in Vienna, Prague, Budapest, Krakow, Bratislava, Kiev, Cardiff, Oxford and Washington D.C. Dr Shifrin has premiered a number of works, including the first American and British performances of the Leopold Mozart "Concerto for Alto Trombone". Moreover, with a PhD in musicology from Oxford University, Ken Shifrin was the recipient of a British Academy Humanities Research Board's Scholarship and the Oxford University Press' Music and Letters Award, as well as being named the Halstead Scholar by the Board of the Oxford University Music Faculty. Since 2000 he has been a British Exchange Scholar for the Czech Academy of Science in Prague and has presented papers at musicology meetings on both sides of the Atlantic. He is the managing director of Virgo Music Publishers and a clinician for Voigt Handcrafted Brass Music Instruments of Markneukirchen, Germany. Dr Shifrin is listed in the International Who's Who of Music. In 2005 the Lord Chancellor of Great Britain appointed Ken Shifrin a Magistrate for England and Wales. Dr Shifrin can be contacted c/o Nigel Pennington, Manager, at Kvalita@aol.com or Orion House Artists Management at patricia@orionhouse.net.
" 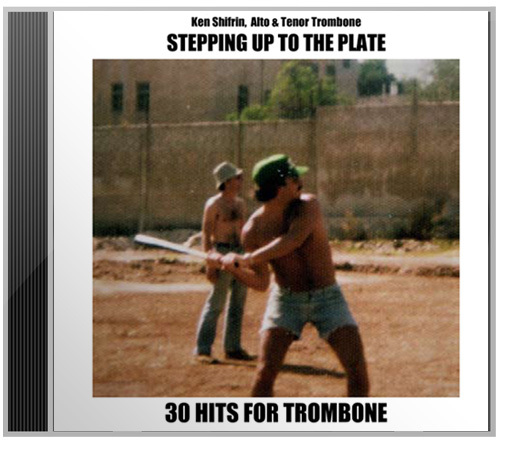 'Thirty Hits' displays Shifrin's versatility, impeccable technique, and expressiveness, with equal command of the alto and tenor trombone, as a soloist, orchestral, and chamber musician. A welcome addition to the library." "Not only is he one of the most able trombonists in my experience but also an intelligent and wide-ranging musician." The soloist Ken Shifrin played brilliantly with almost unbelievable beauty of tone, artistry and elegance. A seemingly effortless rendition full of effects, technical bravura and feeling." "Bolero, Mahler 3 - bravo! Very impressive, especially all the alto trombone ornaments and lip trills all over the joint." "My goodness, what beautiful playing. Ravel and Vivaldi are absolute perfection, one of the best Hindemith's I have ever heard. It is a treat to hear you play in so many settings. Bravo." "Wonderful! It's one of the best Bolero's I've ever heard. Reliably played solo, beautiful tone, admirable fluency."